Whenever we want to gather information on any topic the first thing we do is search it over internet. The search engines then search for various content available on the internet and provide us the best suitable results as per our query. If we talk about search engines then there are many like Google, Yahoo, Bing, DuckDuckGo, Ask.com etc. However, among all these search engines the two most popular search engines are Google Search powered by Google Inc and Bing-powered by Microsoft. 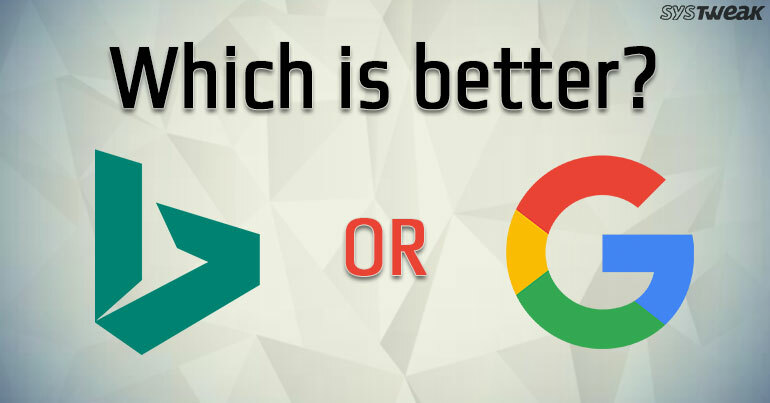 Often there arises a question that from Google and Bing Search which one is better? Which should be preferred more by users? If you too are in such a dilemma then this article will surely help you in deciding the right search engine for you. Bing or Google: Which One to Choose? A really simple question if you go by the stats but quite tough when you dive into the deep. The statistics prove Google as one of the most preferred search engine which is way ahead than Bing. However, if you go by the functionality that you will surely find that the search results provided by Bing are no less impressive than Google. This is one aspect where Bing Search wins the race as it provides better search results as compared to Google. This is because Google often omits the search if it is an adult content, which is not the case with Bing. Moreover, Bing also provides the user a preview of the video by just hovering the mouse over the thumbnail. Another thing where Bing has an upper hand over Google. It was Bing which introduced the infinite scroll and helps a user to continue with the scroll, and avoiding the throbbing clicks on several image results pages. Also, Bing provides its users with more advanced options to search for portrait/landscape, square wide, tall images. This is an area where Bing really needs an improvement. If you are a shopaholic then surely Google search results have more to offer you when compared to Bing. So, if you are looking for a product with best available price then surely head on to Google search as the results will be more prominent. Autocomplete: You have often found then when you start typing on Google or Bing Search then it automatically starts loading suggestions. If you compare the results then you will find that Bing gives you almost double autocomplete suggestions than Google in most cases. This can be quite handy for a marketer which is promoting his product as more autocomplete suggestions will catch more customers. On customer end, also it can provide better alternatives for a product which he is searching for. Paid Search: If you have just started your business and wanted it to make popular by paid search, then undoubtedly Bing is a slightly better option than Google. The reason for this is that for the same keywords which you wish to target you have to pay more for the ads on Google. This means you can even promote your business to a large set of audience if you are running out of the budget. Integration of Social Media: Again, Bing comes out be a champion when we talk about social media integration. The contracts of Bing parent company Microsoft with Facebook and Twitter provides it more access to social media as compared to Google. Rewarding Experience: It is only Microsoft owned Bing which rewards the users for using it. Whenever a user uses Bing to search for anything he is rewarded with some points known as Microsoft Rewards. You can keep on collecting these points to later redeem them at various outlets of your choice. Many will say that it can’t be criteria to decide in between but who doesn’t love free money. Before wrapping up, we just confirm that we nowhere intend to focus on one search engine. It is you as a user who has to decide which search engine suits you more. What Happens to Your Bitcoin When You Die!